Verjuice (/ˈvɜːrˌdʒuːs/ VUR-jooss; from Middle French vertjus "green juice") is a highly acidic juice made by pressing unripe grapes, crab-apples or other sour fruit. Sometimes lemon or sorrel juice, herbs or spices are added to change the flavour. In the Middle Ages, it was widely used all over Western Europe as an ingredient in sauces, as a condiment, or to deglaze preparations. It is still used to some extent in the American South. It was once used in many contexts where modern cooks would use either wine or some variety of vinegar, but has become much less widely used as wines and variously flavoured vinegars became more accessible. Nonetheless, it is still used in a number of French dishes as well as recipes from other European and Middle Eastern cuisines, and can be purchased at some gourmet grocery stores. The South Australian cook Maggie Beer has popularised the use of verjuice in her cooking and it is being used increasingly in South Australian restaurants. Modern cooks most often use verjuice in salad dressings as the acidic ingredient, when wine is going to be served with the salad. This is because it provides a comparable sour taste component, yet without "competing with" (altering the taste of) the wine, the way vinegar or lemon juice would. Verjus, called husroum (حصرم) in Arabic, is used extensively in Syrian cuisine. In Syria, much of the production of husroum is still done over the course of several days by female members of land-owning clans—even if many of them live in cities. The husroum produced during this time will be distributed to various households within the extended family and used throughout the year. The same is true for the production of olive oil and tomato paste. Verjus, called ab-ghooreh (آب‌غوره) in Persian, is used extensively in Persian cuisine, such as in Shirazi salad. Maggie Beer, an Australian cook, vintner and food writer, began the modern resurgence of verjuice when she started commercial production in 1984, after a harvest of Rhine Riesling grapes could not be sold. She persuaded a winemaker who was a friend to assist her in turning the juice into verjuice. After slow national sales, 15 years later came international sales, that were then followed in France and elsewhere by local product. In domestic cooking, an excellent verjuice can be made more simply from an unripened orange, picked at the point comparable to that in grape verjuice, before the sugar develops. The acidity is clearer and simpler than lemon, fresher than grape verjuice. Niagara Oast House Brewers in Niagara-on-the-lake, Ontario developed a farmhouse ale around the use of local Niagara Pinot Noir Verjus with the first release in fall 2015. 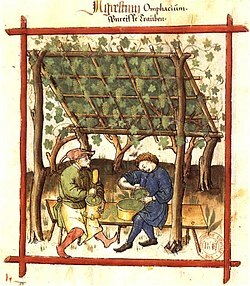 The authors of The Medieval Kitchen: Recipes from France and Italy write that the grape seeds preserved in salts were also called verjus during the Middle Ages. In the French region of Ardèche, a cider fermented from crab apple juice is called verjus. In medieval and early modern English cookery texts "verjuice" sometimes means apple juice or crab-apple juice. Lang, Jenifer Harvey, ed. (1988). "Verjuice". Larousse Gastronomique: The New American Edition of the World's Greatest Culinary Encyclopedia. New York: Crown Publishers. ISBN 0517570327. OCLC 777810992.